It is not for sale or trade. Do not ask me. One of Sierra's earliest adventure games, and generally credited as the first commercial adventure to incorporate color graphics. (Mystery House was the first graphic adventure, but its pictures were black and white.) Serenia, you may recall, is identified in King's Quest V as a town in the kingdom of Daventry. This is actually the same game as Wizard and the Princess. 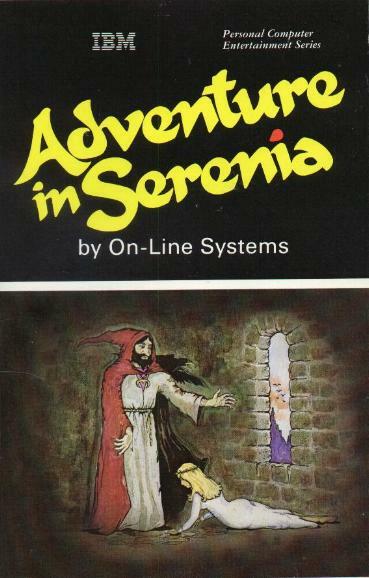 Serenia was published for the IBM PC about a year after the Apple II release as #2 in the Hi-Res Adventure series. Sierra was known as On-Line Systems at the time, and an On-Line folder version exists for IBM PC as well. 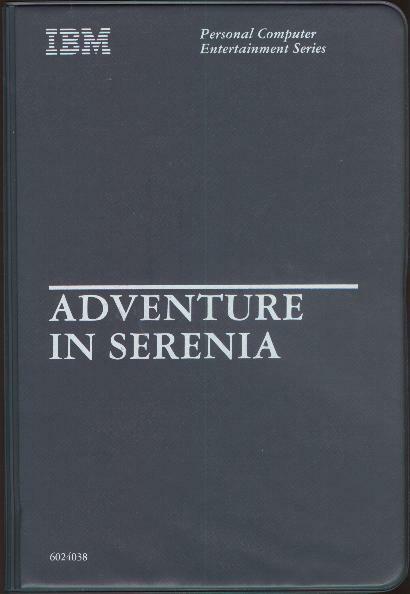 Under the Serenia name, the game comes in the same plastic IBM folder as Microsoft Adventure. The manual cover art is the same as that used for the On-Line folder. A lot of adventure game lists incorrectly identify this as Adventures in Serenia (plural). Adventure, singular, is the correct title. Again: It is not for sale or trade. Do not ask me.